Cornell College visited our biological station for week-long field trip. While at the station, they collaborated with our science team, carried out primate point count surveys every morning and afternoon, and participated in the sea turtle program. The primate data collected will be analyzed and paired with the dung beetle research we have been carrying out, investigating the patterns of this link. 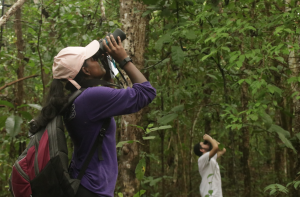 The students worked incredibly hard trekking through the jungle for hours and we can’t thank them enough. Below is a series of short blogs about their experiences with us. We can’t wait to see you next year Cornell College! My experience on the Osa Peninsula was absolutely incredible. From tromping through the rainforest looking for monkeys to being on the beach patrolling for sea turtles, this was an experience unlike any I have ever had before. The highlight of this experience was exploring the vast sandy Piro beach where the sea turtle hatchery was located. While the waves and riptides were not conducive to swimming, the amount of wildlife near the beach made up for it. 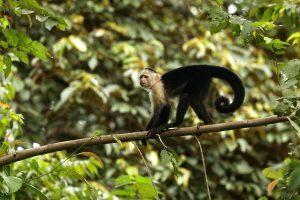 Both times we went we observed around 10 capuchin monkeys and their babies. While we were able to watch the capuchins interact, they did begin throwing coconuts if we got too close! As a whole, I cannot explain everything about the Osa Peninsula. From the people to the places, this is a truly incredible place. This has been my first ever experience hiking in a tropical rainforest. On the second day, we ventured off on a 1-hour hike at 05:00am to reach a point to survey primates. As I am not very athletic, I struggled at the start but I eventually made it. As we went to each of our points, we were surrounded by singing birds as the sun rose and I had a great sense of achievement that I completed the hike and participated in the survey. 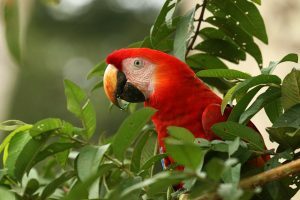 Then, at the last point in the hike, three scarlet macaws, the one bird I had hoped to see, flew over our heads while squawking loudly. I was taken away by the beauty of this sighting and it definitely made the hike worthwhile! If hiking at the biological station means I get to see beautiful wildlife in natural habitat, then I cannot wait to go and hike through the rainforest again. Like a single parent with two jobs of the rainforest, these little leaf-cutter ants never stop working. It doesn’t matter if its dark, raining or even flooded – they keep going. With their “rain hats” made of leaves, the leaf-cutter ants carve pathways throughout the forest as thousands of them walk one-by-one in a line. They all go to the same plant, cut out what they will carry and then make the return trek back to their underground nest where they harvest and feed on the fungus that grows on the leaves. These tiny workers remind me of what “hard work” means and inspire me to reflect on my own work ethic, knowing that I like to sleep a lot and run for shelter when it’s raining. I admire the leaf-cutter ants for their work ethic and adorable choice of hats. I hope one day I can just keep moving through the mud with my very own little leaf hat. The rainforest is for the brave, but still full of charming creatures like sloths, ocelots and coatis. However, there are plenty of creepy-crawlies that are still very cool to observe. I saw many Golden Orb Weaver spiders, a boa constrictor as thick as my arm, and many interesting bugs. To see all these wonderful sites, you need to go out and adventure, hours of hiking in the mud uphill through the humid air and sometimes rain. While not everyone is naturally used to this type of adventure, the experience can be much like how Bilbo Baggins describes adventure: uncomfortable sometimes, but forms bonds between those in the group and not without its rewards. Overall, the adventure is worth the trek and I have seen animals here that I have never heard about before and found many hidden treasures.